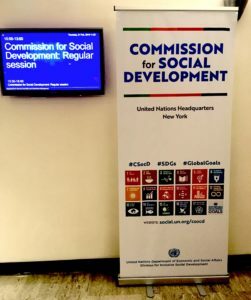 FEBRUARY 21, 2019, NEW YORK—The United Nations Commission for Social Development concluded its fifty-seventh session Thursday morning, adopting several resolutions which reflect the political will of Member States. The Commission meets annually to promote the social aspects of development, focusing on inclusion. This year’s theme, and the subject of one of the resolutions, was “Addressing inequalities and challenges to social inclusion through fiscal, wage and social protection policies.” The resolution mentions the importance of addressing the various dimensions of poverty and inequality, and highlighting key social services, including education. World Youth Alliance welcomes the inclusion of education that affirms and teaches about human dignity in the resolution. As WYA’s Charter states, “the intrinsic dignity of the person is the foundation of every human right.” It is also the basis for the fundamental equality of every human being, and its recognition is key to achieving inclusive development. World Youth Alliance has been working to promote the dignity of the person in policy and culture for two decades. In recent years, WYA has expanded these efforts to reach school children between ages five and fourteen (with extensions through secondary school planned). It has been tested in five regions and has been implemented in several schools, with more partnerships in development. The Human Dignity Curriculum (HDC) teaches children about their dignity, and encourages them to think about how to use their gifts and talents well. They learn about their unique capacities and values, their ability to make good choices, and the “habits of excellence” that will help them thrive and achieve their goals. Children who understand human dignity are not only prepared to make responsible personal decisions, but to contribute to their communities and to treat others with respect in their families, peer groups, and communities, including in their personal relationships. The lessons they learn about solidarity, excellence, and respect encourage them to examine their actions and responsibilities to themselves and others. They will be prepared to contribute to sustainable development and poverty eradication. WYA appreciates the commitment of the Member States and the Commission to human dignity education. We stand ready to help in implementing programs to achieve this goal.